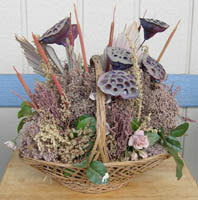 You can make a dried flower basket with the dried flowers that you have preserved. It is so much fun to pick the flowers and then dry them and make them into a beautiful arrangement. You get a feeling of pride and accomplishment, plus look at the money you have saved by doing it yourself. All you need for this craft project is a pretty basket and dried flowers. You mad need to buy a few different items for your arrangement. I had to buy the seed pods for this arrangement because they don?t grow around here. You can also find some great baskets at garage sales and thrift stores that won?t cost you very much. Put a piece of floral foam in the bottom of the basket. For the basket pictured here I had to glue the foam into the basket because the sides are low. Either use craft glue or a hot glue gun. Your dried flower arrangement can be in any desired design that you like. You could also insert a bow in among the flowers. Use any kind of flowers that are available. You can also put in some silk flowers in with your dried flowers. Use your dried flower basket for your table or anywhere you need an accent piece. Just have fun and you can come up with all different arrangements.